After my adventures on Bob’s Peak (no it doesn’t belong to the slightly mad Geared Facile builder who I work with), I realised that I would need to be equipped with a new toy for Queenstown 6hr Super D Enduro. 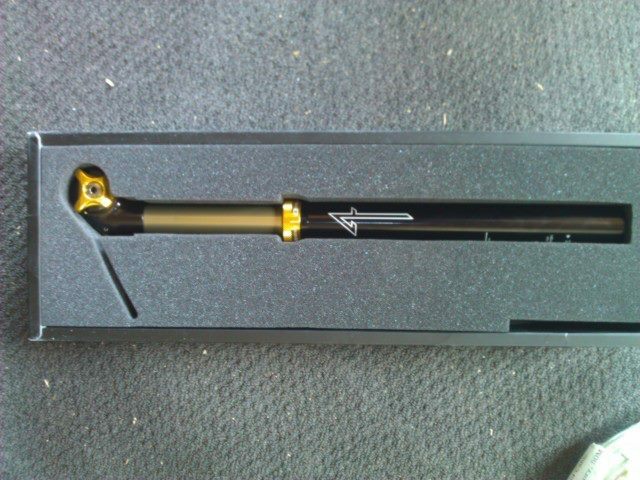 As luck would have it, a quick trip to my lovely LBS, Hub Cycles, and I discovered the Joplin seat post was currently on special. Great news for me and my bank account, and it also meant I didn’t earn any stern looks from my better half for squandering our precious earnings on toys. In next to no time the post arrived at the shop and I soon had it in my hot little hands (this is actually a literal statement, my hands are pretty much always hot and are rather small, but perfectly formed). Unfortunately a weekend full of many tasks meant my lovely new post stayed in its box till today. 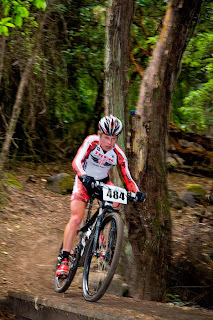 Fortunately one of those tasks was spending all of yesterday at Round 2 of the NZ MTB nationals at Living Springs. The day started out quite bleak and I was mighty glad to spend the morning in the timing tent with Dunedin track building impresario Hamish Seaton, after working a stretch on the registration desk. The age group racers battled rain and freezing winds and I was glad I had a blanket to wrap my legs in. After lunch, and a brief drool over Anton Cooper’s gorgeous new Trek, I grabbed my fluro vest and radio and headed up the hill to marshal the Elite and U19 race. And what a pleasure it was. My spot had good sightlines uphill through some tight switch backs and then down through the forest across a couple of slippery bridges. Watching the Elite guys and girls race was really inspirational, but watching Anton was a real highlight. I’ve seen him race quite a few times, but usually not through technical tight stuff. He rode my section much faster than any of the other riders on the course and seemed to move his bike with almost inhuman skill. The boy is fast. It was a great afternoon cheering young Disco Slippers and all the other awesome riders on, so I wasn’t regretting not being able to ride myself. Today I rectified the lack of weekend riding. The Joplin was super quick and easy to install as I decided not to go for the version with a remote as I don’t really want more cables and bar clutter on my bike. The under seat lever is easy to reach and works great. After a few circles of the driveway I was happy with my seat position and soon I was pedalling up to the start of the Nun. Being able to just drop my seat fully and blast straight in was awesome, but felt a bit weird. I’m very much used to riding the Nun with my seat up. Having it right down made a huge difference. The back end behaved better, I hit more of the little jumps and got more air than I generally do and I would have had one of my best runs if I hadn’t gone through one of the two puddles and ended up with an eye full of mud. And I’m not exaggerating about that. I managed to ride down the rocky section I was half way through, then stopped and tried to rinse the mud out. The rest I blinked away and I’m still getting little lumps of mud coming out the corner of my eye now. Gross. This is the section of track I was half blinded for. Not fun. Second run was even better. I found the optimum drop for my seat, right down just wasn’t quite right and by the third I was pinning it. It would be interesting to see if I can keep up with my husband on his big bike yet. By the end of three runs my legs were jelly and my lungs gasping, but it was brilliant. The Joplin seat post was smooth and worked brilliantly. I love it. I really can’t wait for my birthday when I head down to Queenstown for more gondola shuttles. And finally tonight I want to share this photo I took when I was in Alex of me and my Mum (or for grammar Nazis, my mother and I). 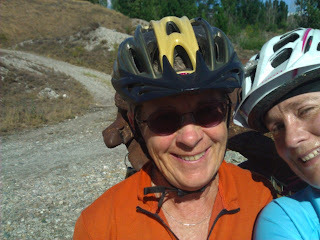 We’re riding the River track that runs from Alex to Clyde and you can tell we’re loving it. My Mum is the reason I started riding bikes, she’d been doing races and endurance rides for years before I got my first bike since university. I love riding with my Mum, she’s always up for a challenge and she’s got great skills. I certainly hope I can still ride so well when I’m in my 60’s (sorry Mum, love you).